The Electoral College has played an important role in presidential politics since our nation’s founding, but surprisingly little information exists about precisely how it affects campaign strategy. 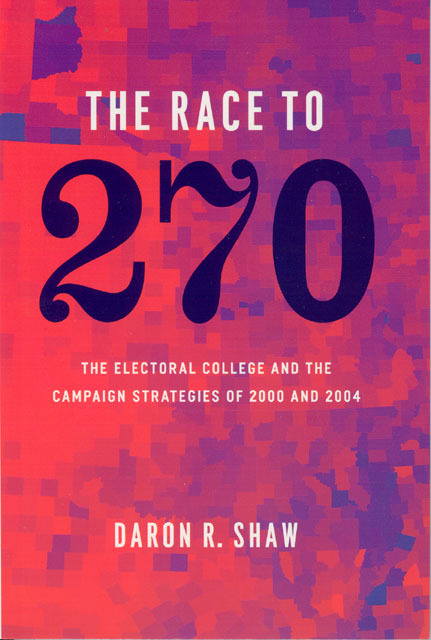 Daron R. Shaw, a scholar who also worked as a strategist in both Bush-Cheney campaigns, has written the first book to go inside the past two presidential elections and reveal how the race to 270 was won—and lost. Shaw’s nonpartisan study lays out how both the Democrats and the Republicans developed strategies to win decisive electoral votes by targeting specific states and media markets. Drawing on his own experience with Republican battle plans, candidate schedules, and advertising purchases—plus key contacts in the Gore and Kerry camps—Shaw goes on to show that both sides used information on weekly shifts in candidate support to reallocate media buys and schedule appearances. Most importantly, he uses strikingly original research to prove that these carefully constructed plans significantly affected voters’ preferences and opinions—not in huge numbers, but enough to shift critical votes in key battlegrounds. Bridging the gap between those who study campaigns and those who conduct them, The Race to 270 will provide political scientists and practitioners alike with fresh insights about the new strategies that stem from one of our oldest institutions.